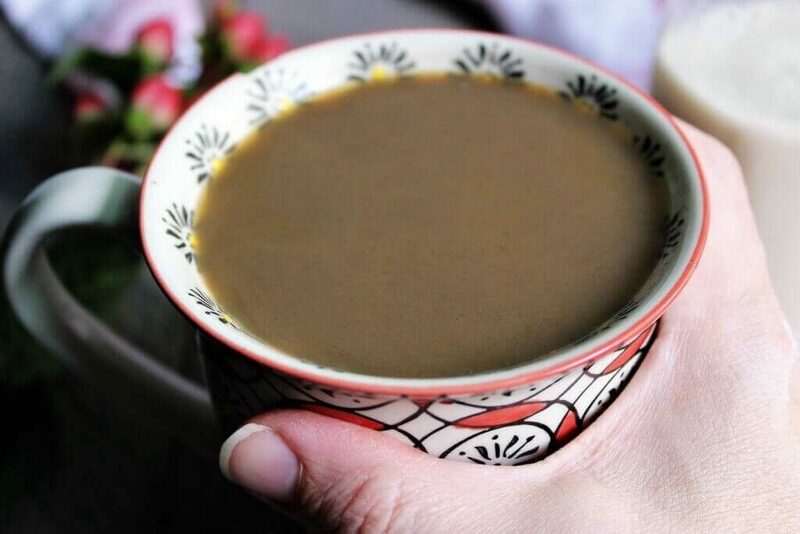 This recipe makes it crazy easy to make your own rich and creamy homemade vegan coffee creamer. 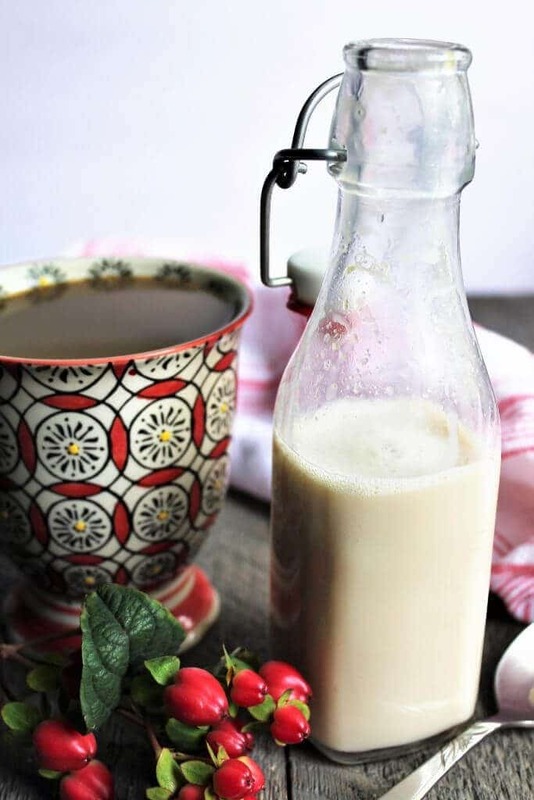 You can make soy, almond, coconut or any plant based creamer that you like in flavors like vanilla, almond, hazelnut, and more. You can make it as sweet as you like with any sweetener you choose, and best of all, you will never need to buy soy creamer again! It’s easy to make with a few simple ingredients. It’s vegan, gluten free, and nut free! You can make it with any plant-based milk that you want! You can make any flavor creamer like almond, vanilla, or hazelnut! Most of the time I simply use soy milk in my coffee, but I occasionally treat myself to store bought vegan coffee creamers. I purchased some on our last road trip to have something to dilute that bad gas station coffee. I happen to notice how simple the ingredients were, and thought that I could easily make this at home! Fiddling with proportions a little, I made it taste just like the store bought versions and I was surprised with how easy it was to make! Now I could enjoy flavored vegan coffee creamers for a fraction of the price! What type of plant-based milk should I use to make my coffee creamer? What flavors of vegan coffee creamer can I make and how? I have used 2 methods to flavor and sweeten the creamer and they both work equally well. Method 1 to flavor and sweeten: Add 1 tsp of flavored extract (like vanilla extract) plus 2 tbsp. 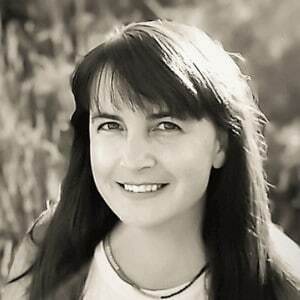 of sweetener (like sugar or agave) to the plant-based milk. Method 2 to flavor and sweeten: Add 2 tbsp of flavored coffee syrup instead of the sugar and extract. What type of sweetener should I use in my homemade creamer? You can leave out the sweetener completely if you want or use anything that you like to sweeten the creamer. It’s really just up to your preference and taste. Note: The amount of sweetener that I suggest makes it taste similar to the flavored soy creamers that you would buy in the store, but if you would like it less or more sweet, please adjust the recipe accordingly. *Remember, if you use method #2, you will not need additional sweetener. How can I make vegan creamer as rich and creamy as real cream? Real cream has fat in it, so it gives your coffee a creamy mouth feel and cuts the acidity of your coffee. To help your vegan coffee creamer have this same effect as traditional creamer, you need to add some fat. I like to use refined coconut oil since it has almost no flavor. If you were to simply add fat to a milk, the fat would just separate and float to the top. So, if you use this method, you must also use lecithin in your creamer. Lecithin is and emulsifier which will bond the plant milk to the oil and prevent it from separating. You can find lecithin at many health food stores or vitamin shops or order it from Amazon. (It’s great to have for homemade dressing and I use it in my homemade vegan butter recipe too). It comes in both liquid and granules. The liquid form devolves better than the granules, and will need less stirring to mix. Can I make fat free vegan creamer? Yes, you do not have to add oil to the creamer. It still comes out well that way too, just not quite a rich. Simply omit the oil and lecithin from the recipe. How do I make homemade soy creamer? 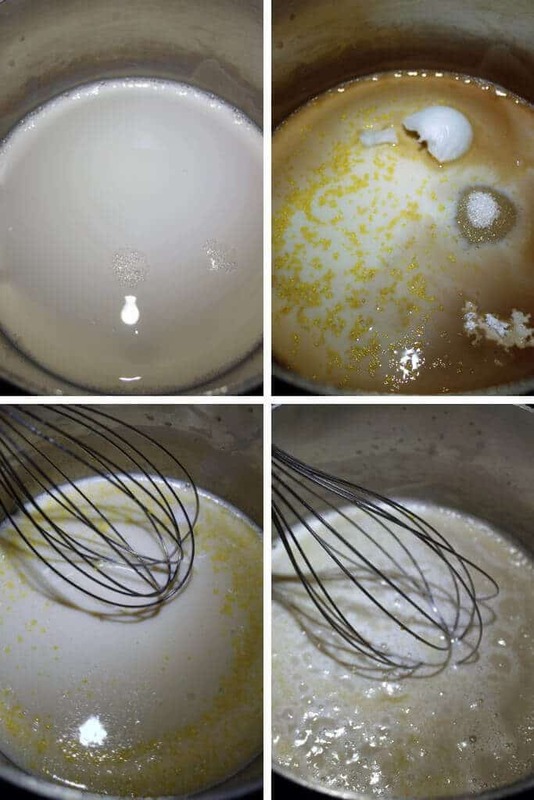 Measure out COLD soy milk or any other plant-based milk, extract flavor of choice, sweetener, some tapioca starch, and oil (if desired) and put it into a sauce pan. Mix the starch into the milk before turning on the heat. Turn the heat to medium and stir frequently with a whisk until it comes to a slow boil. Let it boil for a few seconds while continuing to stir and then turn off the heat. Store in an air tight jar or bottle for up to 5 days. Why do you add tapioca starch? The tapioca starch (aka tapioca flour) is added to thicken the creamer. It gives it more of the consistency of dairy creamer. Tapioca has a nice consistency, but you can also use corn starch or potato starch instead if you prefer. Will this vegan creamer curdle in my coffee? Well, that depends on your coffee. If you have ever noticed that soy milk or almond milk curdles in your coffee, this creamer will probably act in a similar way. It is not the creamer that makes this happen, it is the acidity level of the coffee. If you have this problem, you need to switch the brand or type to a coffee with a lower acidity, not switch vegan creamers. If you can’t get coffee with a lower acidity, let your coffee cool off a little before adding the cream, this will help it not curdle as much too. Since most coffee syrups already have a lot of sugar, you shouldn’t need additional sweetener. Some flavors are hard to find as extracts. If you can’t find the flavor you want in an extract, look for it in coffee syrups. Coffee syrups come in nearly any flavor that you can think of! If using the added fat method, be sure to stir the oil and lecithin well to emulsify them. Put into an air tight jar while still warm. If you let it sit and cool, a film will form at the top of your creamer. 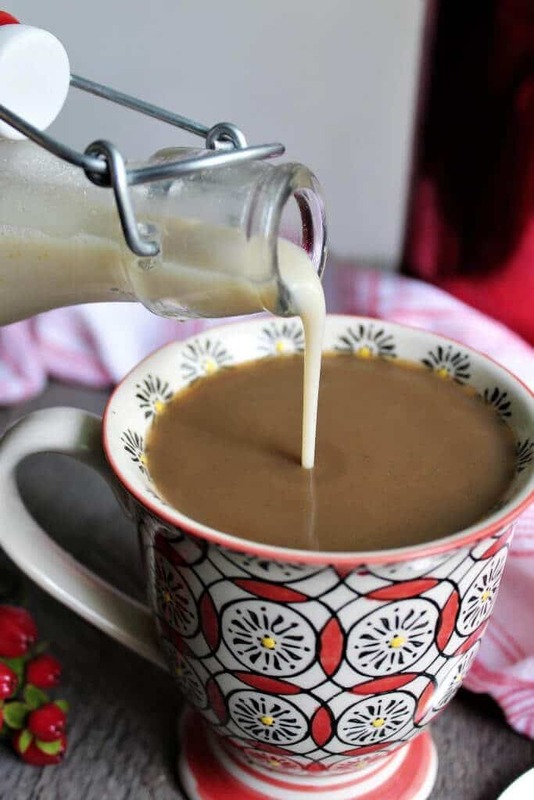 Did you make this vegan creamer? What type of milk did you use? What flavor did you make? Leave a comment and let me know! 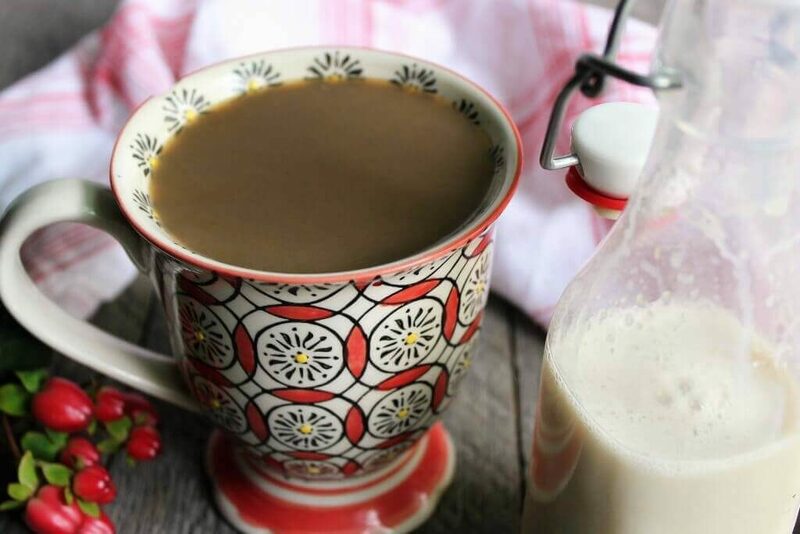 Flavored vegan coffee creamer made with your choice of plant based milk and flavoring. Turn the heat to medium and stir frequently until it comes to a slow boil. Let it boil for a few seconds while stirring constantly and then turn off the heat. You can also use coffee syrups to flavor the creamer. For this method, use 2 tbsp of syrup and omit the extract and sugar. Just made this and it’s delicious! I used almond milk, a chocolate flavored agave syrup, 1tsp vanilla and 1tsp hazelnut extract — sooo good! I do think making it with soy milk would make it creamier. Also need to get my hands on liquid lecithin – would like to try the full fat version too. Can you go without the leitchen but still add the coconut oil? You can Jamie, it just may separate a little. This is great! I don’t care much for soy milk, but there are many other choice. 🙂 I wonder how it would work with flax milk. Goodness, this is a whole new world to me. I’ve never had ‘creamer’ in my coffee before (as far as I know), so it’s really interesting to find what I’ve been missing out on. I don’t like coffee, but I have a few other people to pass this one on too. Brilliant to add a touch of starch for keeping it smooth but just a touch thick. With so much coconut out there, it’s nice to see a soy based option again! Thanks! Soy may be out of fashion at the moment, but it’s still my preferred milk alternative. This looks divine! I really need to give it a try, great tip about adding lecithin too. I have not tried freezing it. I drink so much coffee, I have to double the recipe! 🙂 You can use sunflower lecithin to make it soy free or just make the no fat method. Enjoy! I just made some hazelnut flavored creamer with the hazelnut coffee syrup that I had. It is so good! Thanks for the recipe! I can never find flavored soy creamer at the store. I’m so happy that I can make my own now. Oh, and I made the fat free version that worked great!